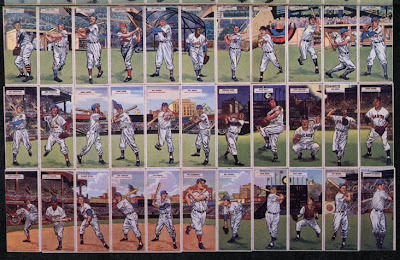 A past post about 1953 Red Man #5 Nellie Fox included a guess that his card background included Comiskey Park's upper-level seats, as the card artist might match Fox to his home stadium. Commenters to that post pointed out that Red Man card backgrounds look somewhat generic and could easily be another park, or no specific stadium at all. 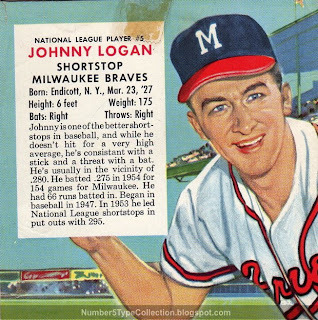 I'm not ready to abandon that idea, though, and today's example gives us a little more to go on, as Milwaukee Brave Johnny Logan poses in front of a tiered porch overhanging a low outfield wall. 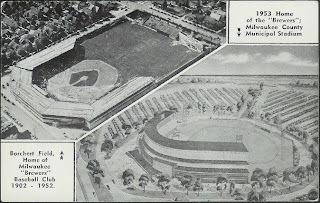 Looking for positives, this could be Milwaukee County Stadium, home of the hometown Braves from 1953 to 1965. The concept postcard with no outfield stands and large parking lots beyond roughly matches what we see behind Logan. A roof-mounted American flag would further sync up to the card, but no stadium pictures I could find had one. Summary: encouraging, if not certain. 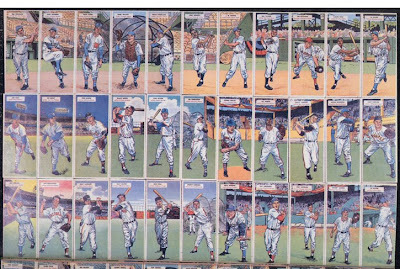 The card-and-stadium conversation reminded me of a 1955 contemporary set, the Topps Doubleheaders. That set's artist upped the ante by including contiguous ballparks on backgrounds of consecutive cards. A turn through the Net54 baseball forums turned up three different scans that show off this creativity. Second and third, check these scans from a Baseball Cards Magazine article by Bill Bossert in 1984. Note how each line of players flows across stands, a batting cage, and other stadium features. The full set includes several actual parks, including Yankee Stadium and Fenway, with 5 or 6 backgrounds spanning the full "image." 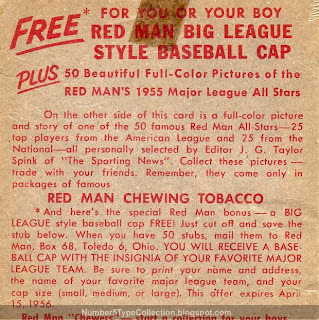 UPDATE: This tobacco box (picture from eBay) shows at least one way that Red Man distributed these sets. Note that card size roughly matches package size, bigger in both dimensions than today's typical card. Value: Low-grade (but artistically impressive) Red Man type cards cost $5 or less. A card with its original package would run many times that, especially if you find one with good provenance. Fakes / reprints: All of the Red Man sets were reprinted in modern times, many with thinner, whiter card stock and a glossier finish. (Originals used brown cardboard and typical 1950s gloss.) Modern card makers have also done Red Man-style cards of modern players, in homage to what proved popular sets in their day. Wow! Another good looking Red Man! The effect of the Topps Doubleheaders when viewed together is beautiful.